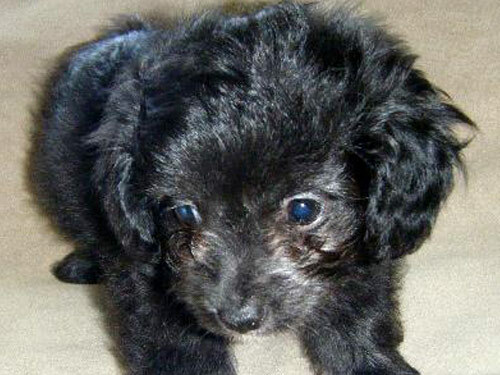 The Chi-poo, also known as the Poochi, is created by the crossing of two breeds: Chihuahua and Poodle. They are commonly referred to as "designer dogs" and are not as popular as many of the other crosses. The ideal Chi-poo is small in stature, agile, and possess a lively expression. They may have the large erect ears of the Chihauhua or the long ears of the Poodle. The Chi-poo should be well-proportioned, stout, and sturdy. Affectionate, loving, and devoted, the Chi-poo will typically form a close attachment to one particular family member. They do not do well if left alone for extended periods of time and will become destructive if bored or lonely. They are not recommended for homes with children under ten years of age. They do will with dogs and non-canine pets they have been raised with. Chi-poo's are suspicious of strangers and will alert their family to visitors or out of the ordinary sounds. Depending on coat type, the Chi-poo requires frequent brushing or professional clipping. Bathing should be done when necessary. The Chi-poo is prone to such health issues as slipped stifle, PRA, epilepsy, ear infection, and skin conditions. The coat of the Chi-poo may be curly, smooth, long or a combination of the three. Early socialization and obedience are recommended. The Chi-poo may be difficult to housebreak. They will not respond to harsh or heavy-handed methods. Training must be done with firmness, fairness, patience, and consistency. The Chi-poo is well suited for apartment living provided they are sufficiently exercised and mentally stimulated. They enjoy securely leashed walks, family play sessions, and off-lead play time in a securely fenced yard.